EghtesadOnline: China has agreed to significantly increase its purchases of U.S. goods and services, the two countries said on Saturday, but made no mention of a $200 billion target the White House had touted earlier. Beijing and Washington agreed they would keep talking about measures under which China would import more energy and agricultural commodities from the United States to close the$335 billion annual U.S. goods and services trade deficit with China, according to Reuters. A joint statement issued at the conclusion of intensive trade talks in Washington did not indicate whether the two countries would delay or drop their tariff threats on billions of dollars worth of each country’s goods, which has sparked fears of a wider trade war and roiled financial markets. “There was a consensus on taking effective measures to substantially reduce the United States’ trade deficit in goods with China,” the joint statement said. President Donald Trump has threatened to impose tariffs on up to $150 billion on Chinese goods to combat what his administration says is Beijing’s misappropriation of U.S. intellectual property through joint venture requirements and other policies that force technology transfers. Beijing denies such coercion and has threatened equal retaliation, including tariffs on some of its largest U.S. imports - among them aircraft, soybeans and autos. While the statement said the two sides would engage at high levels and “seek to resolve their economic and trade concerns in a proactive manner,” it made no mention of tariffs. It said there was consensus between Washington and Beijing on the need to create “favorable conditions to increase trade” in manufactured goods and services. This could be a reference to China’s previous pledges to open up more economic sectors to services. A commentary published by Xinhua on Sunday declared the statement a “good example of win-win”, noting that it would help America reduce its trade deficit by increasing exports to China and allow China to diversify and raise the quality of its imports. It also argued that China has always resisted any “unreasonable demands” by the United States, never compromising or accepting restrictive conditions. The commentary added that a resolution to the trade dispute will be complicated, difficult and take a long time. 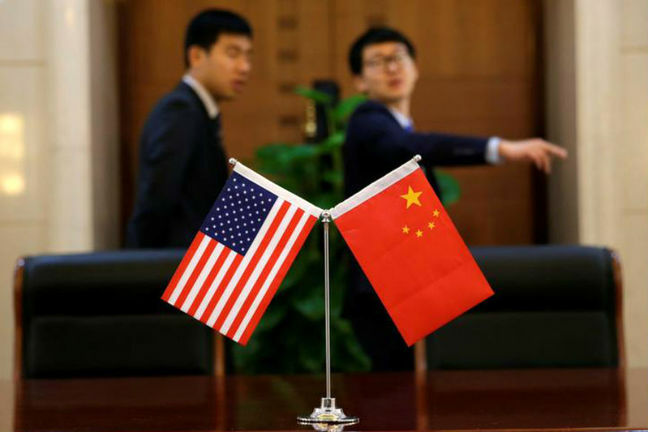 The United States will also send a team to China to work out the details of increased agricultural and energy exports, the countries said, without specifying timing. A senior U.S. official said that during discussions with a member of President Xi Jinping’s office, China was considering a package that relied on major purchases of U.S. liquefied natural gas, including a contract for a U.S. firm to build LNG receiving and processing facilities in China. The package, which also would include new commitments on intellectual property protections, could be agreed by a potential mid-year visit to Washington by China’s Vice President Wang Qishan, the official said. Trump made cutting the U.S. trade deficit with China a promise in his presidential campaign. During an initial round of talks earlier this month inBeijing, Washington demanded that China reduce its trade surplus by $200 billion - a figure most economists say is impossible to achieve because it would require a massive change in the composition of commerce between the two countries. As of late Thursday, U.S. officials were still pressing China to agree to that size reduction. But economists say that level would be extremely difficult to achieve, especially as U.S. tax cuts are spurring demand for more imports. The $200 billion figure is equivalent to about 90percent of Boeing Co’s (BA.N) annual aircraft production and is larger than all of the United States’ global annual agricultural and oil exports. Eswar Prasad, a Cornell University trade professor and former head of the International Monetary Fund’s China division, said that Beijing had clearly balked at a specific quantitative commitment. “It is a very limited and tentative agreement mainly designed to deescalate tensions,” Prasad said of the joint statement. There are concerns among some legislators and trade experts that Trump could give priority to a narrower trade deficit over tackling what they say is China’s abuse of intellectual property rights. Any deal under which China would import more goods could easily be reversed, economists say. The statement made no mention of whether there would be a relaxation of paralyzing restrictions on Chinese telecommunications equipment maker ZTE Corp (000063.SZ)(0763.HK) imposed last month by the U.S. Commerce Department. The action, related to violation of U.S. sanctions on Iran,banned American companies from selling semiconductors and other components to ZTE, causing the Shenzhen-based company to cease operations. Earlier this week, Trump tweeted that he directed the Commerce Department to put ZTE back in business and said the company's situation was part of an overall trade deal with China.